ARLINGTON January 31, 2019 – The United States Agency for International Development (USAID) recently awarded Nathan the five-year ASEAN-USAID Inclusive Growth in ASEAN through Innovation, Trade, and E-Commerce (ASEAN-USAID IGNITE) contract with a ceiling of approximately $12 million. Under ASEAN-USAID IGNITE, Nathan will work with USAID to promote inclusive growth and economic integration in the ASEAN Economic Community (AEC) through improvements in the trade environment. The project represents the U.S. Government’s continued commitment to strengthening the ASEAN-U.S. Strategic Partnership. 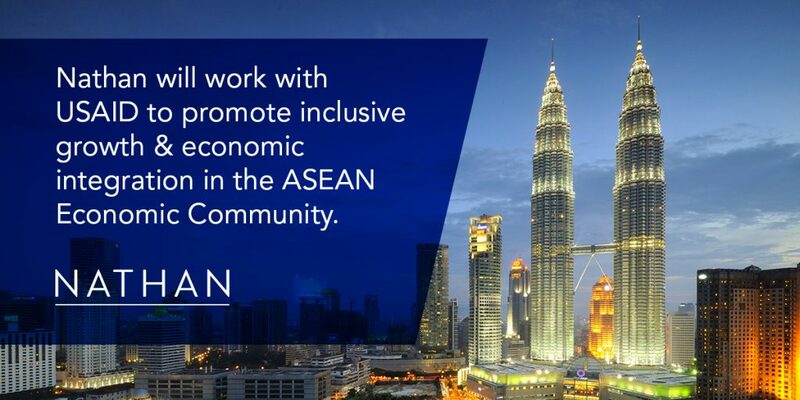 ASEAN-USAID IGNITE will build on the achievements of USAID’s US-ASEAN Connectivity through Trade and Investment program, also implemented by Nathan, and will support ASEAN economic integration efforts in the areas of trade facilitation, the digital economy, and science, technology, and innovation. In all of its work, the project seeks to promote a more inclusive environment for micro, small, and medium-sized enterprises and strengthen conditions for women’s economic empowerment, including through the promotion of gender equality and women’s participation in trade. The project will continue to support past USAID work, including the implementation of the ASEAN Single Window, standards harmonization, and the ASEAN-US Science Prize for Women, among other activities, while expanding support for digital finance, other digital services, and research and development. The project will also work with other agencies to implement the recently announced ASEAN-US Smart Cities Partnership and efforts to promote cooperation on cybersecurity and connectivity.